No one makes watches quite like the Swiss, and the same seems to be true of smartwatches. While competitors tout the ability to check text messages and emails without having to pull out a phone, which is pretty convenient, or answer calls just by holding your hand to your ear, which is admittedly kind of awesome, the first Swiss smartwatch promises a 41MP camera. If James Bond were in the market for a smartwatch, he'd put down a pre-order for the Hyetis Crossbow. As you would expect, the device has NFC support and is WiFi and Bluetooth-enabled. 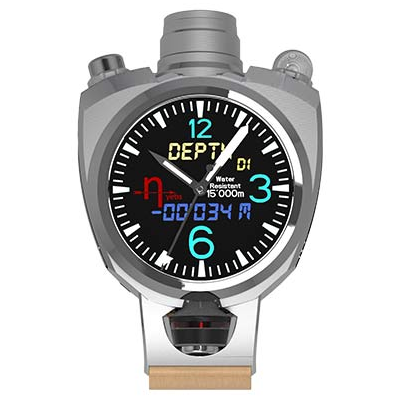 An altimeter, microphone, thermometer, and other gauges all come included. The band even has biometric sensors that can measure a wearer's physical condition. The watch is programmed to interact with Android, iOS, and Windows Phone 8 devices, comes with a touchscreen, and did we mention that camera? It's positioned at the top of the clock where the crown usually would be. The Crossbow may be high-tech, but it doesn't eschew the quality Swiss watches are known for. It's made of titanium, and the face is shielded by sapphire glass. On top of that, this thing still tells time. It uses automatic wound movement that is kept separate from the other additions that make this watch smart. This is a watch for the those among us who felt the previous offerings have just looked far too tacky. Initially, Hyetis will distribute 500 collector's editions of the Crossbow globally, and at $1,200, it makes the Pebble look downright affordable.